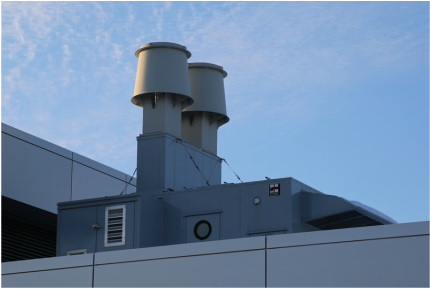 Centralized, redundant, fume-hood exhaust system with heat recovery. 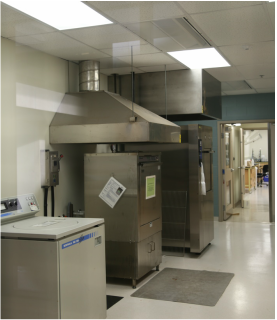 This building required a complete overhaul for a brand-new state-of-the-art suite of engineering laboratories. Doing the construction all at once allowed for efficiency centralized redundant systems to be installed. The building housed 7 distinct laboratories under one departmental suite. The new HVAC system has a make-up air unit with hydronic heat recovery loop, variable speed operation and variable speed fume hoods; the whole building uses a fraction of the energy before the construction still with all the required air changes, exhaust and temperature control. 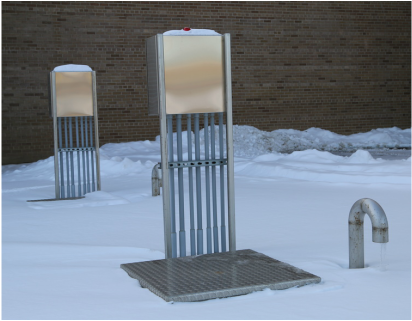 It may not look like much, but like an iceberg, there are giant tanks buried underground with an elaborate pumping and piping system to allow researchers to do continuous flow research for waste water processing. Each laboratory in the suite had a number of individual requirements. Seen here are two hoods specially designed for heat and humidity capture. Each hood is operated through sensors in order to minimize the energy consumption.